The Volkswagen e-Golf is a sporty hatchback that debuted as a 2015 model being the German automaker’s first fully electric vehicle for the U.S. marketplace, joining the more than 30 million Golf models sold worldwide. The e-Golf is part of Volkswagen’s “Think Blue” holistic approach to sustainable and efficient electric mobility that includes a carbon offset program, which is a collaboration with 3Degrees®, a renewable energy serviced provider, to invest in carbon reduction projects to help offset the emissions created from production, distribution and charging of the e-Golf for up to approximately 36,000 miles of driving. Charging solutions from Bosch® and Chargepoint®, along with a Roadside Assistance Plan and the VW Car-net® e-Golf app designed to make ownership of the e-Golf a reassuring and pleasurable experience. that helps to take the anxiety out of the “range anxiety” plaguing most vehicles that are propelled exclusively by electricity. 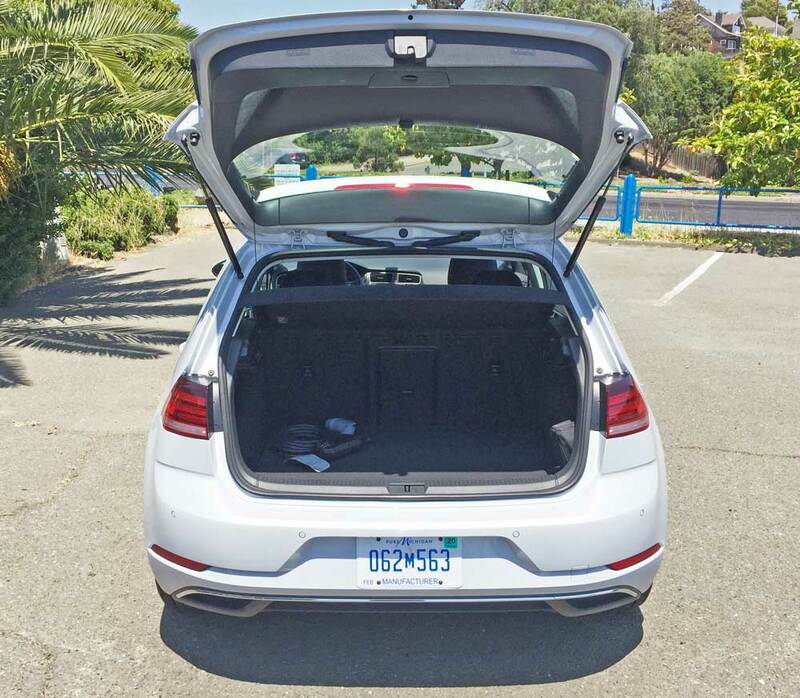 VW claims the e-Golf to be the most versatile electric vehicle in its class, and it has zero tailpipe emissions. 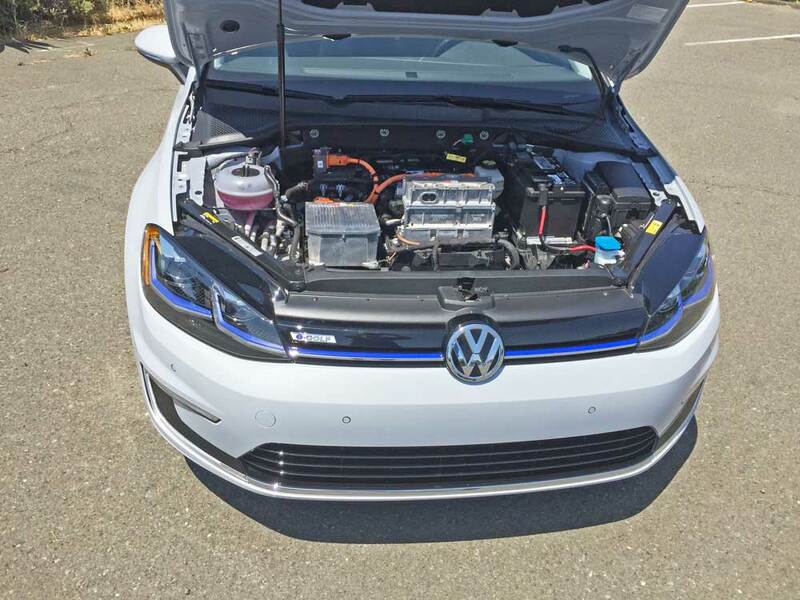 The drivetrain of the e-Golf consists of a forward mounted 35.8 kWh Synchronous AC Permanent Magnet Electric Motor with a 36.8 lithium-ion battery pack – 324 V in 264 cells weighing 710 lbs. The motor’s energy drives the front wheels through a direct drive automatic transmission with a single speed forward gear and reverse. It comes with an onboard charger. Standard fast charging capability allows for the battery to achieve an 80 percent charge within 30 minutes. Recharging may also be accomplished with 110/120 volt socket, which takes approximately 20 hours and a 240-volt wallbox delivers a complete recharge in less than four hours. The VW estimated range is 125 miles. The e-Golf was the first U.S. Marketed VW to be outfitted with all-LED headlights. Reining in the e-Golf are power-assisted four-wheel discs (vented front) with three-channel, 4-wheel ABS, EBD, ESC and a regenerative braking system that helps to replenish battery power. 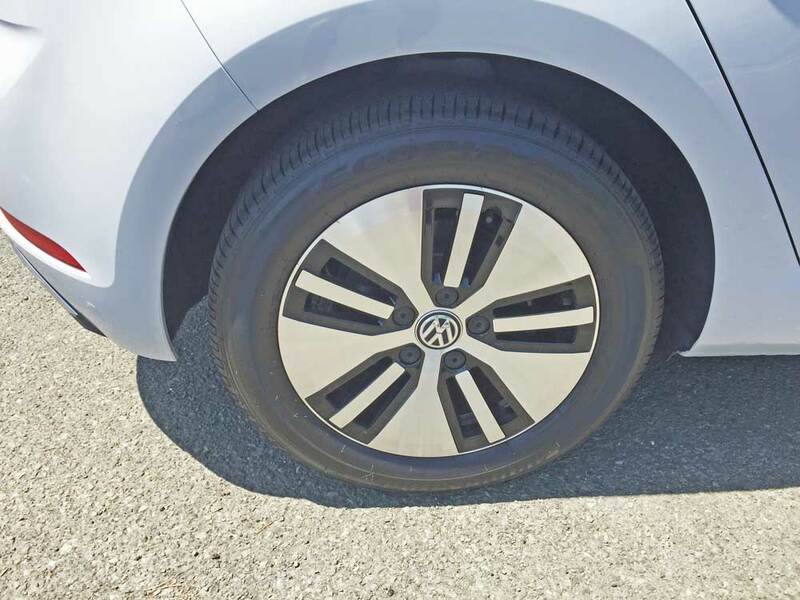 The e-Golf rolls on Bridgestone Ecopia 205/55 R16 all-season low-rolling resistance tires mounted on 6.5-inch wide 5-solid “Y”-spokes with a small insert spokes and black painted background aluminum alloy wheels. The suspension componentry consists of a strut-type with lower control arms, coil springs, telescopic dampers and anti-roll bar up front, and a Multilink system with coil springs, telescopic dampers and anti-roll bar in the rear. 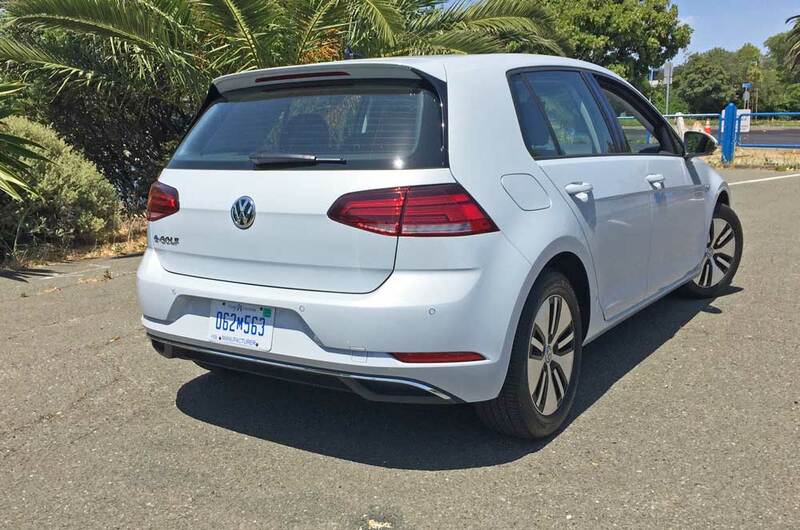 The wheelbase of the Volkswagen e-Golf is 103.5-inches and its overall length measures 168.1-inches. It is 70.8-inches wide and 57.1-inches tall, and weighs in at 3,455 pounds. The drag coefficient is 0.27. 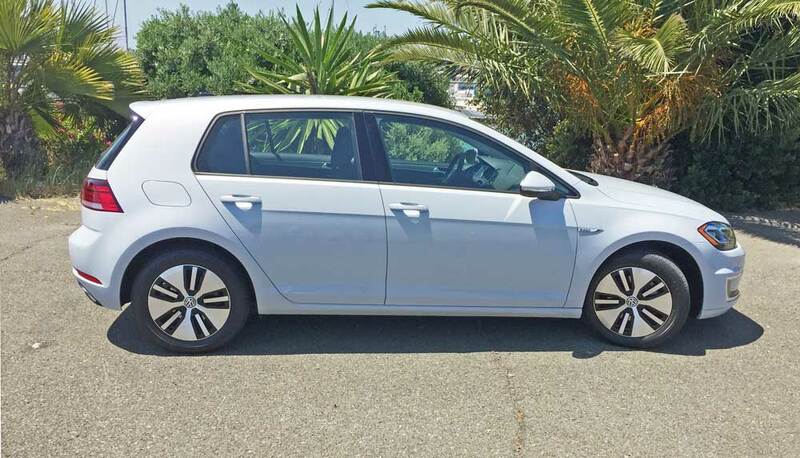 The e-Golf’s exterior design is for the most part, shared with other members of the new Golf family – the lines are sharp and well defined featuring dynamic proportions. There are however, some key distinguishing features, the most notable of which is the energy-efficient LED headlights. These LED clusters are complemented by C-shaped LED daytime running light strips in the bumper below. Other elements that define the e-Golf’s all-electric composition are unique badges and blue accents, as well as the lack of any tailpipes. The 16-inch aluminum alloy wheels that fit snugly within the pronounced wheel arches. 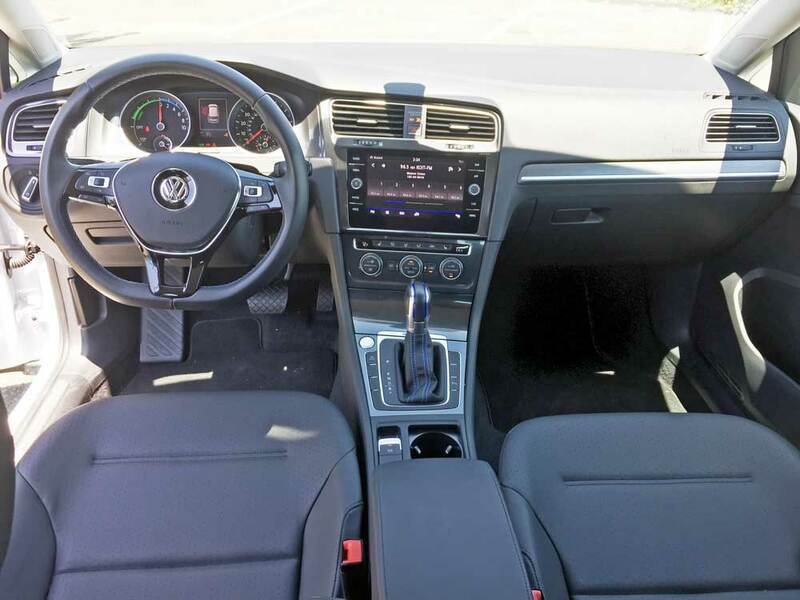 The interior incorporates all of the common elements found in the rest of the Golf stable, while adding special accents and a specific instrument cluster that displays the status of the electric system’s unique operation. To the right of the power display, is a conventional speedometer with a lower section that depicts the current stage of the battery’s charge. The e-Golf provides two technologies allowing the driver to exercise control over the vehicle’s energy consumption: there are three driving profiles designed to preserve energy – (“Normal”, “Eco” and “Eco+”); and there are also three levels of regenerative braking (“D1”, “D2”, and “D3/”B”). The e-Golf automatically defaults to the “Normal” driving mode, offering full horsepower and torque. The ”Eco” mode allows limited horsepower torque. The various “D” settings for regenerative braking determine the levels of regenerative power. 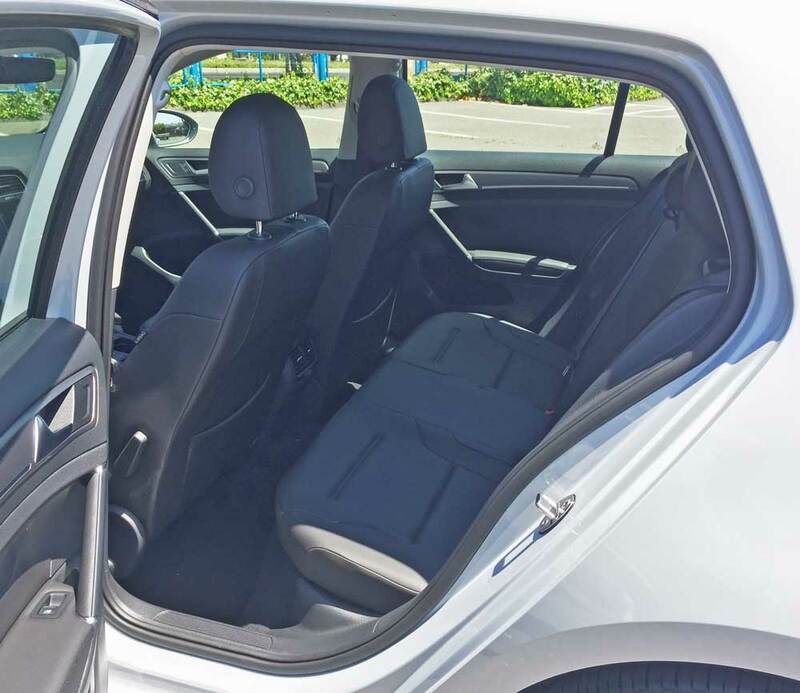 The e-Golf comes with a full complement of both passive and active safety systems and features, matching the rest of the golf lineup. 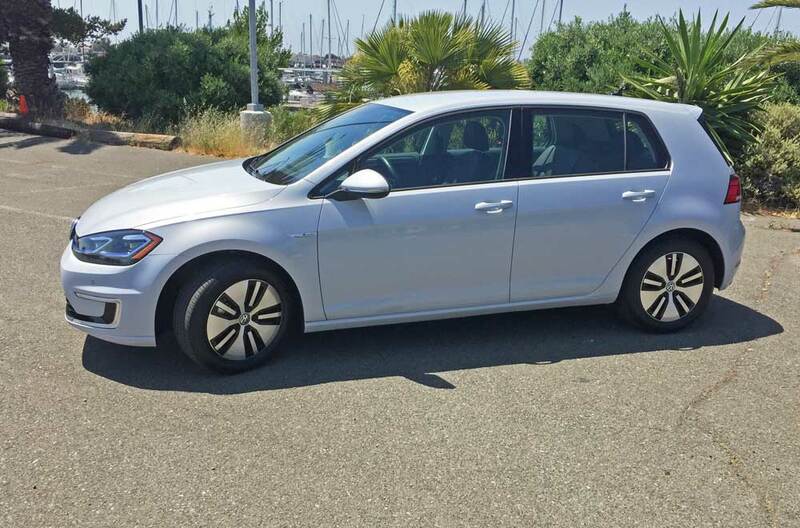 My most recent test vehicle was the 2017 Volkswagen e-Golf SEL Premium. The exterior was finished in a White Silver metallic with a Black leatherette interior. 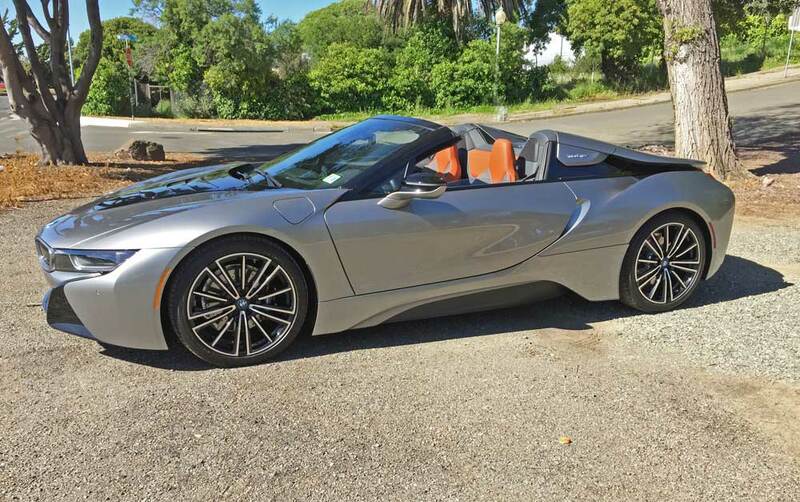 The base price was set at $36,995, which totaled $37,845 after adding the destination and delivery charge. It was fully loaded with no options. Standard features included: LED headlights and LED DRLs; an onboard charger; 16-inch alloy wheels; a heat pump; a touchscreen navigation and infotainment system; Sirius XM® satellite radio; a Media Device Interface with iPod integration; Bluetooth® connectivity; VW Car-Net connected services; V-Tex leatherette seating surfaces; leather-wrapped multi-function steering wheel and shifter knob; heatable front seats; Climatronic® dual zone automatic climate control; front and rear Park Distance Controi; a rearview camera and rain-sensing windshield wipers. The 2017 Volkswagen e-Golf SEL Premium hatchback is only sold in select states, with increased availability coming as charging station infrastructure grows. 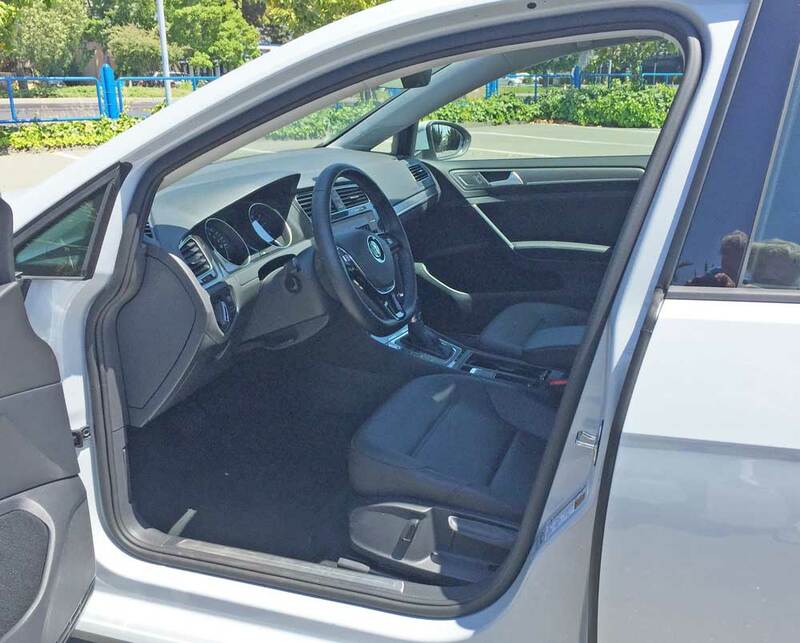 Driving the e-Golf is actually fun, and it is actually better planted than some of its stablemates, due to the low positioning of the battery which weighs 701 pounds, and is composed of 264 individual prismatic cells that due to their efficiency, require no special cooling system. The cells are integrated in 27 modules of either six or 12 cells each, collectively producing a nominal rating of 323 volts and an overall capacity of 35.8 kWh. The battery has a limited warranty that covers eight years or 100,000 miles against 70 percent capacity. Handling characteristics are sporty, with an on-center steering feel and the ride quality is firm, but not harsh. The range is of course dependent upon driving style, terrain and temperature, but with VW’s Roadside Assistance Plan, if the e-Golf runs out of charge within 100 miles of the owner’s home, Volkswagen will arrange for the car to be delivered to a nearby, convenient source for recharging, as well as pay any taxi or transportation fees incurred by the owner. There’s also an impressive Limited Warranty and Scheduled maintenance program that enhances e-Golf ownership. 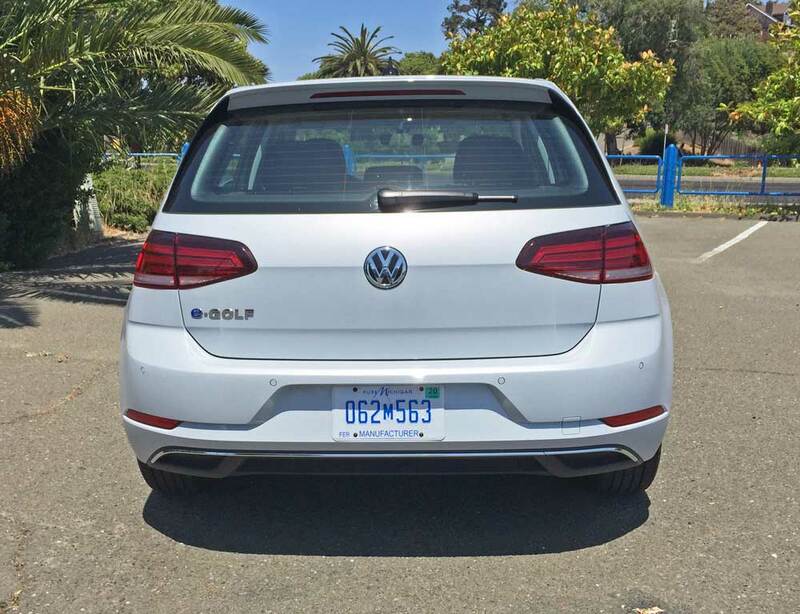 In the final analysis, the VW e-Golf is certainly one of the more affordable and versatile electric vehicles available in today’s marketplace, if you reside in one of the select areas where it’s sold. By the way, the stated cost, does not take into account the available tax credits and rebates that are available federally and regionally. Note – the 2018 model VW e-Golf is not on sale yet. Engine Type and Size: 100kW synchronous AC permanent magnet electric motor with a 36.8 lithium-ion battery pack – 324 V in 264 cells weighing 710 lbs. Transmission: Single speed forward gear and reverse. Brakes: Power-assisted, dual circuit four-wheel discs (vented front) with three-channel, 4-wheel ABS, EBD and ESC. 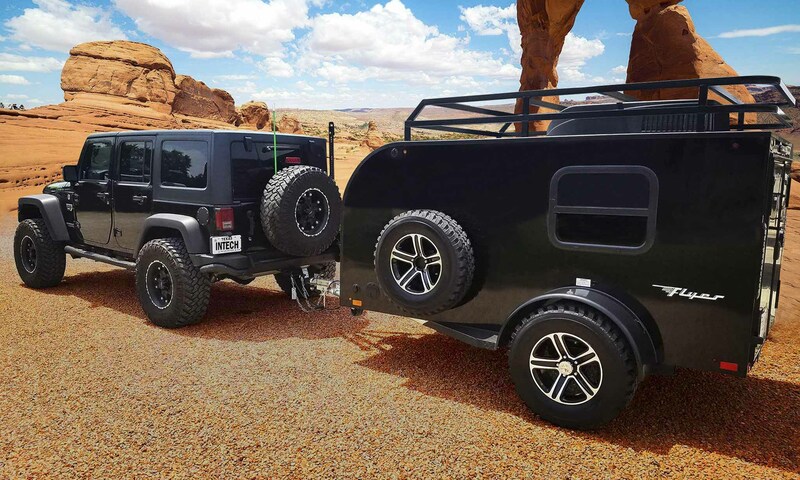 Tires: Bridgestone Ecopia 205/55 R16 all-season mounted on 6.5-inch wide 5-solid “Y”-spoke with small insert spoke and black painted background aluminum alloy wheels. Fuel Capacity: No fuel – all-electric. EPA Mileage Estimates: 126 city / 111 Hwy / 119 combined MPGe. Average range per full charge – 125 miles.